I found a wonderful article on the Huffington Post today. The posting is from the blog of Ir Amim, an Israeli non-profit that works to examine issues of the Israeli-Palestinian conflict within Jerusalem. When I was last in Jerusalem, I took a tour of East Jerusalem with Ir Amim. 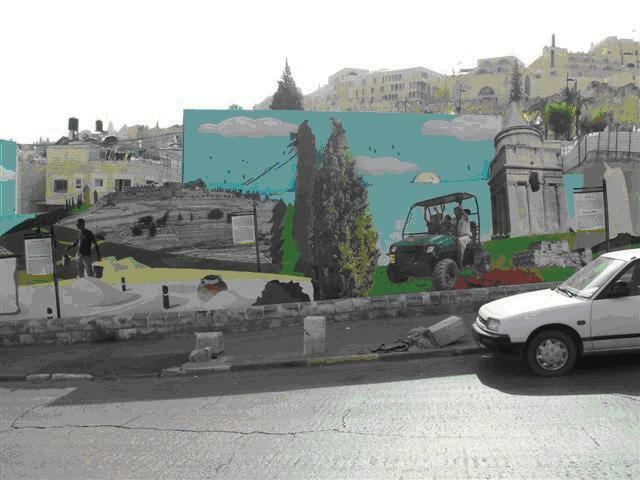 The author of this story, Yizhar Be’er, writes about cheerful murals that decorate walls in East Jerusalem, what they say about the conflict and, especially, what they hide. It is a fascinating report with some compelling images. The link is here, but I’ve included the story it in its entirety below. You have to see it to believe it. 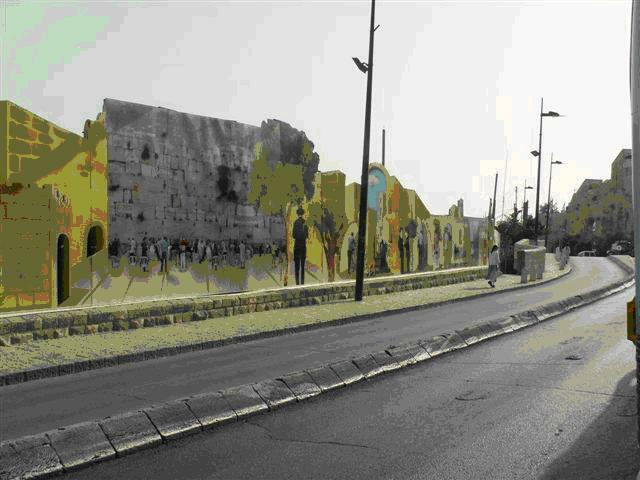 The photographs that appear here document the murals that stretch dozens of meters down the length of the road that leads from the neighborhood of Silwan — that is, the City of David — along the Eastern Wall of the Old City on the way to Dung Gate. The murals decorate a wall that conceals one of the ugliest and conflicted corners of the world. 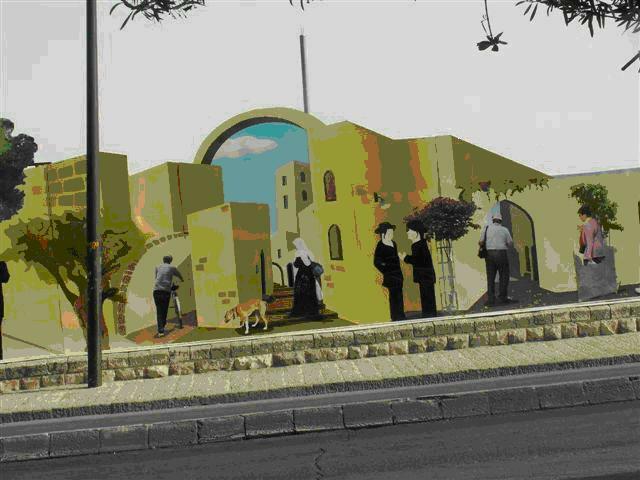 Similar murals can be seen along the border between the Jewish neighborhood of Gilo and the Palestinian neighborhood of Beit Jalla during the days of firing between Jerusalem and Bethlehem during the second intifada. I saw murals like these in Belfast, when the Civil War of Northern Ireland was still playing out on the streets and in the pubs. But the skirmishes there are long over, so whoever is looking for such insanity now has to come here, for here you can find it in abundance; especially in the City of David — that is, Silwan–the place where, as they say, it all began. Whoever looks at these murals — pop art-style oil paintings in a style that’s gleaming, crisp, and crisp, like the industrial paintings of Andy Warhol — sees an image that doesn’t exist in reality, but may be led to believe depicts the city of Jerusalem. The greatest enemy of knowledge, the mathematician Stephen Hawking once said, is not ignorance, but the illusion of knowledge. These murals present a reality that is imaginary, illusory, and utterly alienated from the darkness and treachery that is being conducted beneath and atop the very grounds of the holy basin of the Old City. The hills of this imaginary Jerusalem are grassy and green and carry the symbols of Jewish sovereignty: the Knesset, a menorah, Montefiore’s windmill. Beyond the murals sprawls the true reality: the run-down Arab neighborhood of Silwan with a gaping wound in its middle, the pit of the “Givati Parking Lot,” one of many megalomaniac projects of the Elad organization–a right-wing entity that aims to thwart any possibility of arriving at a compromise agreement in Jerusalem. The State of Israel, in a fit of insanity, handed the administration of one of the most sensitive and explosive sites in the world to Elad. But we’ll get to that. The next segment also paints an imagined reality. The Western Wall, cloaked in moss and sadness, with lovely and clean Jews standing around with polite self-discipline. The Western Wall plaza, empty and glittering against the unsightly foreground of the flooring of the actual city: dirty, poor, beleaguered. In this third section we will examine how the narrative of Jerusalem has been radicalized to portray a city that is green, modern, secular, and open to the winds of the world–in other words, all that is foreign and opposed to the possessive and sealed off city in which I live. The Yad Avshalom monument, which according to Jewish tradition holds the remains of the rebellious son of King David, is shown planted in the center of a green hill, upon which glides a golf cart against the blue sea and sky. The sun is rising (or is it setting?) on the eternal capital, half submerged in the water. On the side, a Hebrew worker labors–an Elad man, most likely–with two buckets in his hands, hovering above a pile of cement. The man embodies what by now is the nostalgic fantasy of the good Hebrew laborer, a Zionist emblem that has long been replaced by the flood of Arab workers who uphold the construction industry. It is only the sidewalk stones, dislodged from their places in front of the mural and lying alongside the actual asphalt road, that remind us of the neglect and ugliness that no amount of oil paint can correct, and neither the cement that the diligent worker prepares in the image. The concrete can’t cover over a thing, owing that ancient Jerusalem, like the heart of a nuclear furnace, is boiling over from within. The Arabs (still) populate the majority of the land in the holy basin, including the lands of the Old City and Silwan/City of David, as well as the holy sites outside the city walls. The ground beneath their houses are the sites of secretive digs which rattle the ground, crack the walls and the roads, and pave the way for the big explosion, the inevitable eruption which is sure to come. The radical right-wing organization Elad, in its activities with the approval and authority of the Israeli government, is embittering the lives of hundreds of Palestinian residents. Jewish settlers have control over properties in the heart of Arab neighborhoods and disseminate small islands of settlement which create impossible mosaics. They are aided by the Israel Antiquities Authority–which has acquiesced to the generous payment proffered by Elad–to dig on Elad’s dime and with the support of the Jerusalem Municipality, government offices (every Jewish administrator in Arab areas is given a personal security attaché funded by the government), and even the police. Arab residents of Silwan who dared to appeal to file legal opposition against the digs that were cracking the walls of their houses were arrested by police in the dead of night and charged with ridiculous accusations that were never brought to court but were sufficient to plant fear. It’s hard to believe, but the surrealistic plan to dig a tunnel beneath the entire Old City from Damascus Gate to Dung Gate is already beginning to find its footing on the ground. In several places, digs are being run just dozens of meters from the Al-Aqsa Mosque. Handing over the administrative keys to one of the most sensitive and volatile sites in the entire country, and possibly the world, to a political, extremist organization is akin to deciding to hand over the keys of the nuclear base in Dimona to Ahmedinejad and friends. In any event, the Arabs are convinced that the Jewish settlers living in their neighborhoods are trying to reach under the Temple Mount, and ultimately aspire for their very destruction. Just another conspiracy theory? Not necessarily. Thousands of Jews identify with the movement to rebuild the Temple. They gather around Succoth in the national convention center and swear to “remove the abomination” (i.e. the holiest Muslim site in Jerusalem and one of the holiest sites of all of Islam) from the premises. In this reality, all the pieces are adding up to the colossal Armageddon that awaits. Even in the idyllic mural of Jerusalem of high, signs and symbols are concealing themselves from evil messengers. One can find in the murals Israelis, tourists, the ultra-Orthodox, the nationalist-religious, the secular, a smattering women and children, but only two Arabs. Two images of Arabs were selected to represent the quarter-million Arab residents of the city. Below is Arab A, standing alongside an imaginary wall of Jerusalem. Passing behind him is a group of tourists who are indifferent to his existence. Arab A stands, leaning on his walking stick, and glances around (what is he plotting?). Beside him: a dog. Arab B appears in the second picture. 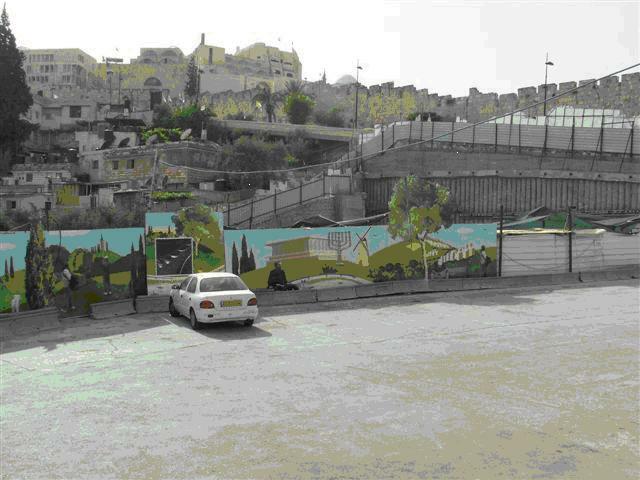 The background of this part of the mural is the alleyways of the new Hebrew Jerusalem. Two Yeshiva students stand around talking, a woman returns from shopping, a boy in a knitted yarmulke walks home with his bicycle. Arab B, a woman in a traditional embroidered dress, steps into an alleyway, with her back half-turned against the viewer. Next to her stands–you guessed it–a dog! 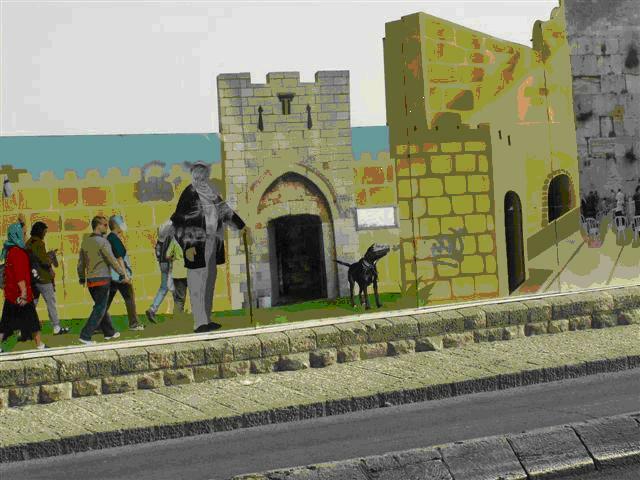 Did the anonymous artist deliberately plant two dogs–an animal known by Israelis to be considered impure by the Muslim tradition — next to the only two Arab figures in the huge mural that extends along the entire holy basin? I don’t know the answer, and the truth is that the answer is not all that important. It is enough that the Arabs are convinced that this was the intention. And here vandals managed to blot out the faces of both Arab A and the dog that stands beside him. Dogs and pigs have long been hazardous material in the Muslim world. The oft-used taunt–a settler favorite–that couples “pig” “dog” and “Muhammad” are words that light fires. Dogs are an impure animal according to Islam. According to tradition, the prophet Muhammad claimed that angels do not enter houses with dogs or pictures (Orthodox Judaism, similarly, considers it forbidden — even an image is considered an abomination). Another tradition says that a Muslim who runs into a dog on his way to pray must purify himself again, even if the dog did not touch him. In Muslim folk culture, in any case, a dog is a contemptible animal. In this reality, in which every drop of mutual trust has long since evaporated, intention doesn’t matter. The question — “Did settlers really intend for their archeological digs to run up against the foundations of mosques in reaching for the very roots of Jewish existence?” — is not particularly relevant; much like the question of whether the Arabs really do want to throw us into the sea. It’s enough that Muslims and Israelis, respectively, are convinced enough as to the (positive) answers to both of these questions as to have already amassed a stockpile of ammunition that could, with the slightest disturbance, engulf everything in sight. As we say in Hebrew, “The dog is buried here.” In other words, X marks the spot. Yizhar Be’er is the founder and executive director of Keshev – The Center for the Protection of Democracy in Israel, an organization that researches the Israeli media, threats to democracy, and the Israeli-Palestinian conflict.